Home delivery PLUS e-Edition and monthly Subscriber Benefits. 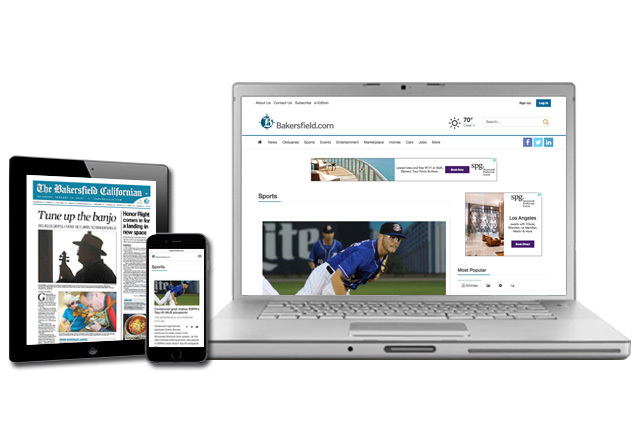 The e-Edition, the digital replica of the printed newspaper, delivered to your desktop, tablet or smartphone by 6 every morning, and monthly Subscriber Benefits. Subscribe to All Digital Access for only $1.54 a week for 52 weeks. 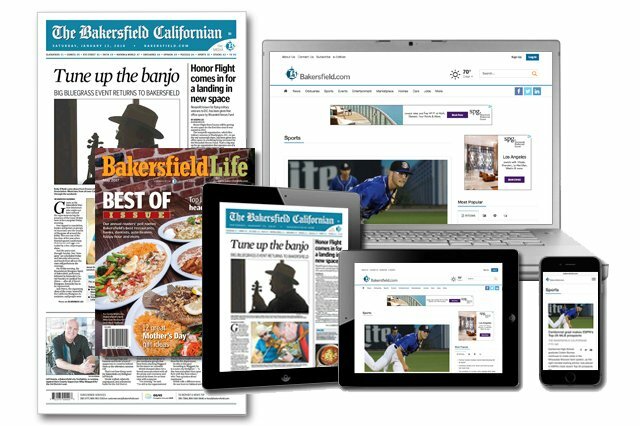 Unlimited access to Bakersfield.com, including breaking news, photo galleries, video and other content not available in print. Does not include e-Edition. 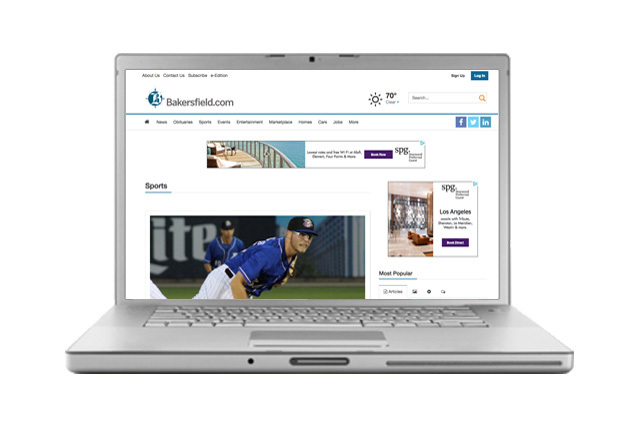 Automated subscriber services are available 24/7 for your convenience at https://services.bakersfield.com/. If you prefer personal service, contact us during office hours by calling (661) 392-5777 or (800) 953-5353, or emailing CustomerCare@bakersfield.com. Mon-Fri 6 a.m. to 2 p.m. Please allow 2 business days for processing online transactions. You can report a missing paper or delivery problem by contacting us at CustomerCare@bakersfield.com, using our online automated system, or by calling (661) 392-5777 or (800) 953-5353. You can update your account information online here or by contacting us at CustomerCare@bakersfield.com or by calling (661) 392-5777 or (800) 953-5353. Simplify your life with EZ Pay. It’s an automatic payment plan where you can renew your subscription each month from either your credit card or checking account. You may make a payment online by using your Visa, Mastercard or Discover credit card through our online automated system. You may make a payment by phone with your checking account, Visa, Mastercard or Discover credit card by calling us at (661) 392-5777 or (800) 953-5353. What if I Don’t Want to Pay by Credit Card? We also accept checks, money orders, debit cards and cash. Please make cash payments at 3700 Pegasus Drive. Are there digital only and print only rates? Yes. The digital only rate is $7.99 per month. All print subscriptions come with access to the digital version. How Can I Tip My Carrier? You may include carrier tips with your renewal payments, send a separate check or money order, or include as a fixed amount in your monthly EZ Pay debit. You will receive a renewal 30 days prior to your expiration date. We will continue to deliver the paper during your grace period, unless otherwise notified. We now deliver to your computer, tablet or smartphone! You can find out more about this and subscribe by clicking here. We can mail your subscription anywhere in the Continental U.S. Please contact customer service for rates and subscription plans at (661) 392-5777 or (800) 953-5353. We maintain a one year archive of newspapers. Contact customer service via phone (661) 392-5777 or email CustomerCare@bakersfield.com to inquire. You can purchase a gift subscription online or by contacting us at CustomerCare@bakersfield.com or by calling (661) 392-5777 or (800) 953-5353. It's a good idea to use our convenient Vacation Hold service when you're going out of town for a few days. We can hold your papers and deliver them when you return, or you can donate your papers to our Californian in Education program. If you prefer, you can suspend delivery and you will not be charged for these days. Just contact us at CustomerCare@bakersfield.com, use our online automated system, or call us at (661) 392-5777 or (800) 953-5353. What is a Vacation Donation? The vacation donation program is our number one source of funding for the CIE program. This program is simple, and anyone who has a home delivery subscription can participate. When you go on vacation, you have the option to donate your newspapers to the CIE program. Just contact us at CustomerCare@bakersfield.com, use our online automated system, or call us at (661) 392-5777 or (800) 953-5353. What is the Californian in Education Program? We established the Californian in Education program more than twenty years ago. This program provides our local schools with copies of the newspaper at little or no cost to them. The use of the newspaper helps students develop strong reading and writing skills, while allowing them to explore math, science, politics, health, geography and current events that are relevant to their everyday lives. We also provide teachers and students with special educational programs throughout the school year. You can share a carrier compliment by contacting us at CustomerCare@bakersfield.com or by calling (661) 392-5777 or (800) 953-5353. If you have a question or problem that this site doesn't address, please feel free to contact us at CustomerCare@bakersfield.com or call (661) 392-5777 or (800) 953-5353. Thanks for reading The Bakersfield Californian!